Just some random thoughts tonight. My husband Ray just worked a 48 hour shift (paramedic at the hospital ER) and came home at 7 am this morning. Thankfully he was able to sleep all day today to catch up on his sleep. He hardly ever gets to sleep while he’s there at the hospital, because during the 7 am to 7 pm time slot that is supposed to be his time of rest (before he goes on official shift at 7 pm), he often gets woken up as back up crew for the ER. Truly paramedics, firefighters, police, and those who serve in the military are our nation’s heroes. We’ve had a week of homeschooling and I am trying to establish a routine now. I have decided that my family MUST be priority, even if it means less blogging, less time writing and podcasting. I am going to try to not lose any momentum and will try to continue my goal of blogging 3-4 times a week and having a new weekly podcast– but if I can’t, I hope you can understand my priorities. One of the things that has helped us in the past with homeschooling is staying home more. Sounds simple but it’s so easy to run to the store for some milk or to do a coke run or to go to the post office to mail that letter. I have begun buying sheets of postage stamps at payday, to save on trips to the post office, and am just putting letters, bills, etc., in our mailbox for the postman or postwoman to pick up and mail for me. I also try to limit trips to the grocery store (note: we only have ONE here because it’s a small town!) to twice a month on payday. Of course, there are times when you run out of eggs, milk or other items and have to go to the store. But stocking up really helps to cut down on excessive trips – which means less stress. I also try to keep up with laundry which in our house seems to multiply despite having only one child left at home now. Raquel at The Glamorous Life shares some good laundry tips. Leah learned to ride her bike this summer. You may be wondering why on earth she learned to ride it so late in life. Before we moved here this year, we lived in the country on a gravel road. It was really hard for her to learn to ride without falling down and getting pretty scraped up. Our driveway had some dirt and some gravel, but had huge potholes and we didn’t have the money then to fill our driveway with fresh gravel or sand. This year we moved to a small town where we’re on an actual paved street. I was able to find her an almost brand-new bike for a fraction of the cost at a friend’s garage sale – one that fit her height. She is now riding it when her friend Nichole comes over to hang out with her. She’s still working a little on those turns, but I’m a proud mom! 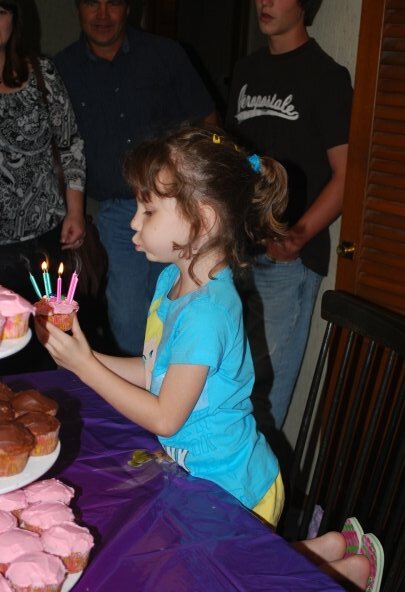 Our granddaughter Annabelle just turned six years old and had her birthday party this weekend. It was a Tinkerbell theme. Our daughter Heather baked cupcakes – strawberry and chocolate. Annabelle got lots of cute presents. I can hardly believe she is 6 years old! Recently we saw our daughter Eden’s baby big boy Jacob. He is 18 months old, growing so fast, and VERY active now – into EVERYTHING! He is adorable. Eden says she has a really hard time keeping the house clean with him walking, climbing, and exploring. After having a houseful of all girls (with our monthly hormones! ), Ray is thrilled to have a boy in the family. Our first home-grown tomatoes ripened! We have been enjoying fresh sliced tomatoes from our own yard! I did not know the plants get so tall. Am I supposed to prune them? The tomatoes do taste a little acidic. Does anyone have ideas how to improve that- do we treat the soil or what? One of my dear friends is having surgery tomorrow morning. My daughter Heather and I went to her house today to pray for her. I was also privileged to be able to pray last night for my next-door neighbor, who recently had a biopsy and is waiting for the results this week. Thank you Jesus that you are the Healer. ← Just change your mind!